The straight dope on Italian health and medical care, from an American woman doctor who lives and works in Rome. Her memoir, Dottoressa, will be published in May 2019. The drive took a solid hour through driving rain, over roads that shrank to lanes then to trails, and by the time we handed over our parking fee at the gate of Harbin Hot Springs night had fallen. As we inched forward through the mud, pale figures began to emerge from the darkness, swinging flashlights, and sporting boots but not another stitch of clothing. Both “funky” and “we can arrange something” suddenly made sense: this joint was nudist! The next morning as we stood soaking to our chins along the edge of the warm pool, exchanging smiles with fellow-hedonists, a burly fellow climbed in as naked as the rest of us, scanned the faces, chose mine, and extended his hand saying, “You look like you could use a watsu.” “A what?” “Close your eyes and I’ll show you…” The WATer shiatSU treatment he gave me, swishes and stretches and massages on the surface of the water, was a blissful pas de deux that must have lasted only ten minutes but felt like forever. In my life I’d had lots of massages and other kinds of body work, but watsu was in its own league. As I later learned, watsu was invented in the early 1980s by Harold Dull, who moved to Harbin after making his name as a poet in San Francisco. His inventive spirit transported zen shiatsu, which he had studied in Japan with its inventor, Shizuto Masunaga, to the warm spring waters of the hippie spa. The experience is relaxing and energizing at the same time, somewhere between meditating, flying, and dropping mescaline. At least that’s what it felt like to me. After some years of making runs up to Harbin every time I was in California, in 2000 I decided I’d try seeing what it was like to take on the other role. Giving watsu treatments turned out to be nearly as mind-blowing as receiving them, and three hundred hours of training later I was ready to start practicing bodywork on days I wasn’t seeing patients with colds and cystitis. There was only one hitch: finding the right pool. A watsu pool has to be large enough to swing a client around, calm and quiet enough to permit complete relaxation, just the right depth, and just the right temperature (34º-35º Centigrade, 93º-97º Fahrenheit). Jacuzzis are too small, heated swimming pools not heated enough. Italy’s many famous hot springs can be great for watsu, but the closest to me is an hour and a half drive. …until one day I heard the place had been closed down – by the vice squad. When eventually they did re-open, they thought it more prudent to bar outside therapists. I moved on to the lovely swimming pool in the basement of the Grand Palace Hotel on Via Veneto, which they were willing, for a reasonable sum, to heat to watsu temperatures on special request. But around 2010 it too closed down, voluntarily, and when it reopened two years later the new management couldn’t be talked into hosting such a suspicious-sounding activity as water-based massage. Alas, I don’t yet have a decent substitute yet anywhere in Rome – the only appropriate pool I’ve found prices itself out of the running. All suggestions are welcome. Saddest of all, my beloved Harbin Hot Springs was destroyed in the northern California fires of 2015. It is still struggling to rebuild. Mobile phone readers: to subscribe, scroll way down. I moved to Rome in 1978 after finishing my training in New York, and have been practicing primary care internal medicine there ever since, treating a clientele that’s featured Roman auto mechanics and British ambassadors, Indonesian art restorers and Filipina maids, Russian poets and Ethiopian priests. 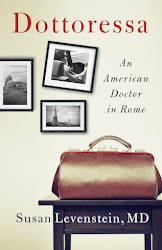 When not seeing patients, doing research in psychosomatic medicine, or being the Artist's Wife to my composer husband, I've written a book about my medical adventures, Dottoressa: An American Doctor In Rome, to be published by Paul Dry Books in May 2019. My memoir, coming in May!